New publication from Vishal and Steve! We have developed droplet microfluidic devices in thermoplastics and demonstrated the integration of key functional components that not only facilitate droplet generation, but also include electric field-assisted reagent injection, droplet splitting, and magnetic field-assisted bead extraction. 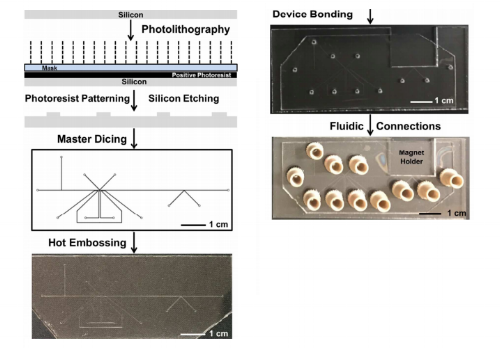 We manufactured devices in poly(methyl methacrylate) and cyclic olefin polymer using a hot-embossing procedure employing silicon masters fabricated via photolithography and deep reactive ion etching techniques. Device characterization showed robust fabrication with uniform feature transfer and good embossing yield. Channel modification with heptadecafluoro-1,1,2,2-tetrahydrodecyltrichlorosilane increased device hydrophobicity, allowing stable generation of 330-pL aqueous droplets using T-junction configuration. Picoinjector and K-channel motifs were also both successfully integrated into the thermoplastic devices, allowing for robust control over electric field-assisted reagent injection, as well as droplet splitting with the K-channel. A magnetic field was also introduced to the K-channel geometry to allow for selective concentration of magnetic beads while decanting waste volume through droplet splitting. To show the ability to link multiple, modular features in a single thermoplastic device, we integrated droplet generation, reagent injection, and magnetic field-assisted droplet splitting on a single device, realizing a magnetic bead washing scheme to selectively exchange the fluid composition around the magnetic particles, analogous to the washing steps in many common biochemical assays. Finally, integrated devices were used to perform a proof-of-concept in-droplet β-galactosidase enzymatic assay combining enzyme-magnetic bead containing droplet generation, resorufin-β-D-galactopyranoside substrate injection, enzyme-substrate reaction, and enzyme-magnetic bead washing. By integrating multiple droplet operations and actuation forces we have demonstrated the potential of thermoplastic droplet microfluidic devices for complex (bio)chemical analysis, and we envision a path toward mass fabrication of droplet microfluidic devices for a range of (bio)chemical applications. Newer PostThe Bailey Lab shows off their work! Older PostCongrats to Yi on the new publication in Lab on a Chip!